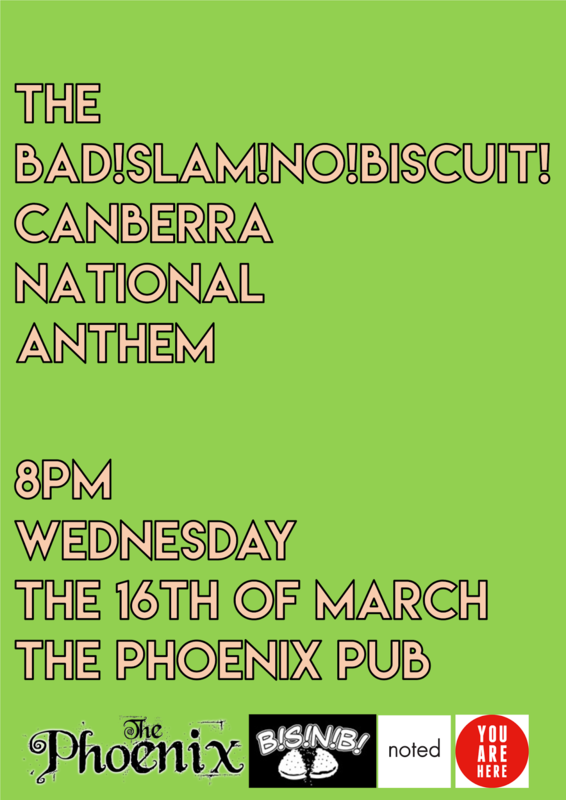 On Wednesday 16 March, 8:00pm in the Phoenix Pub, BAD!SLAM!NO!BISCUIT! 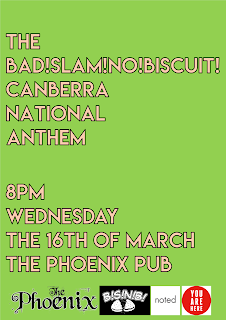 launches the Australian Capital Territory’s definitive national anthem, THE BAD!SLAM!NO!BISCUIT! CANBERRA NATIONAL ANTHEM. To fix Canberra’s Centenary Celebration’s failure, BAD!SLAM!NO!BISCUIT! commissioned Canberra’s renaissance person of fitness and music, Nick Delatovic, to compose THE BAD!SLAM!NO!BISCUIT! CANBERRA NATIONAL ANTHEM. The inaugural singing is at BAD!SLAM!NO!BISCUIT! in the Phoenix Pub, before forever being free online under creative commons. Find the lyrics in Bill Poetries (as part of the Noted Festival) and in your very own songbook available at the Phoenix Pub on the night. Be part of history as BAD!SLAM!NO!BISCUIT! gives Civic, the inner north, the Australian Capital Territory, Australia, the World what they’ve always needed- THE BAD!SLAM!NO!BISCUIT! CANBERRA NATIONAL ANTHEM. Supported by BAD!SLAM!NO!BISCUIT!, YouAreHere and Noted. Since 2009, BAD!SLAM!NO!BISCUIT! has fought for poetry in the Australian Capital Territory! It’ll fight anyone for poetry, even when no one wants poetry fought for. Which is frequently. To that end, with the support of the Phoenix Pub, it runs BAD!SLAM!NO!BISCUIT! as the World’s first and last poetry slam in The Phoenix, and with the support of the Ainslie and Gorman Arts Centres it runs the Salt Room in the Gorman Arts Centre. The Salt Room is the poetry night Canberra deserves. The longest-running team behind BAD!SLAM!NO!BISCUIT! contains Andrew Galan, Joel Barcham and Amanda Coghlan, with regular assistance from Canberra’s documentator of Canberra’s Arts Scene, Adam Thomas. Thanks to Merloc where the recording is taking place, and thanks to Ryan Schipper for his support as one of the producers. Thanks also to long-time sponsors Impact Comics and The Games Capital. RIP BAD!SLAM!NO!BISCUIT! co-founder Adam Hadley.